Size of pillows: 40 x 40 cm. Pillow 1. You will need: 300 g of lemon yarn MAX (50% merino wool; 50% acrylic, 40 m / 50 g); straight needles number 10. Knitting density: 9 p. And 11 p. = 10x10cm. 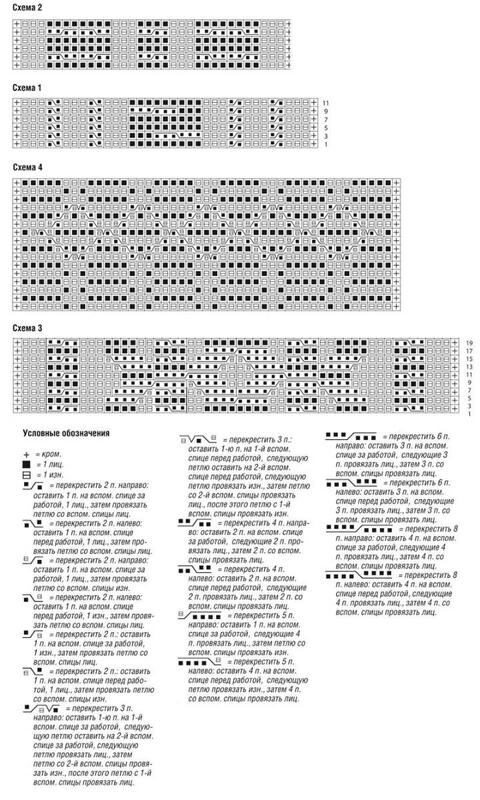 Dial 37 p. And knit according to scheme 1, which shows individuals. r., in izn. R. knit loops on the pattern. Repeat from 1st to 12th p. Link total 88 p. = 80 cm. Then close all loops. Short sides folded face up, perform side seams. Unscrew the cover, fill with filler, sew the bottom hole. Pillow 2. You will need: 300 g of MAX salad yarn (50% merino wool. 50% acrylic, 40 m / 50 g); straight needles number 10. Type 34 p. And knit under the scheme 2. which shows individuals. r., in izn. R. knit loops on the pattern. Repeat from the 1st to the 12th p. Link total 88 p. = 80 cm. Then close all loops. Short sides folded face up, perform side seams. Unscrew the cover, fill with filler, sew the bottom hole. Cushion 3. 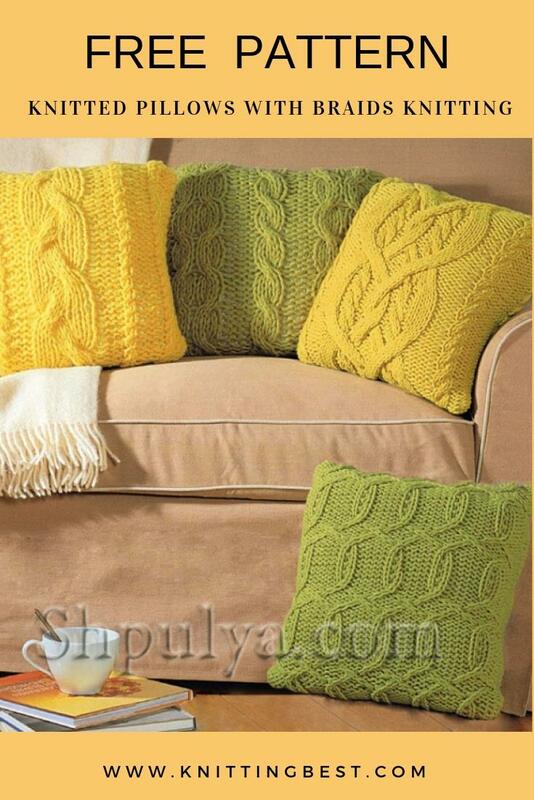 You will need: 300 g of yellow-green MAX yarn (50% merino wool, 50% acrylic, 40 m / 50 g); straight needles number 9. Type 54 p. And knit under the scheme 3, which shows individuals. p .. in out. R. knit loops on the pattern. Repeat from the 1st to the 20th p. Link a total of 120 p. = 80 cm, then close all the loops. Fold the short sides with the front sides, complete the side seams, unscrew the cover, fill with filler, sew up the bottom hole. Dial 47 p. And knit under the scheme 4. Lits. R. read from right to left, izn. R. - in the opposite direction. Repeat from the 1st to the 16th p. Link a total of 130 p. = 80 cm. Then close all loops. Short sides folded face up, perform side seams. unscrew the case, fill with filler, sew the bottom hole.